(New York, August 25, 2016) – Separatist insurgents in Thailand's southern border provinces have committed an apparent series of bombings against civilians that may amount to crimes against humanity, Human Rights Watch said today. Insurgents detonated two bombs on August 23, 2016, following multiple bomb and arson attacks on August 11 and 12. 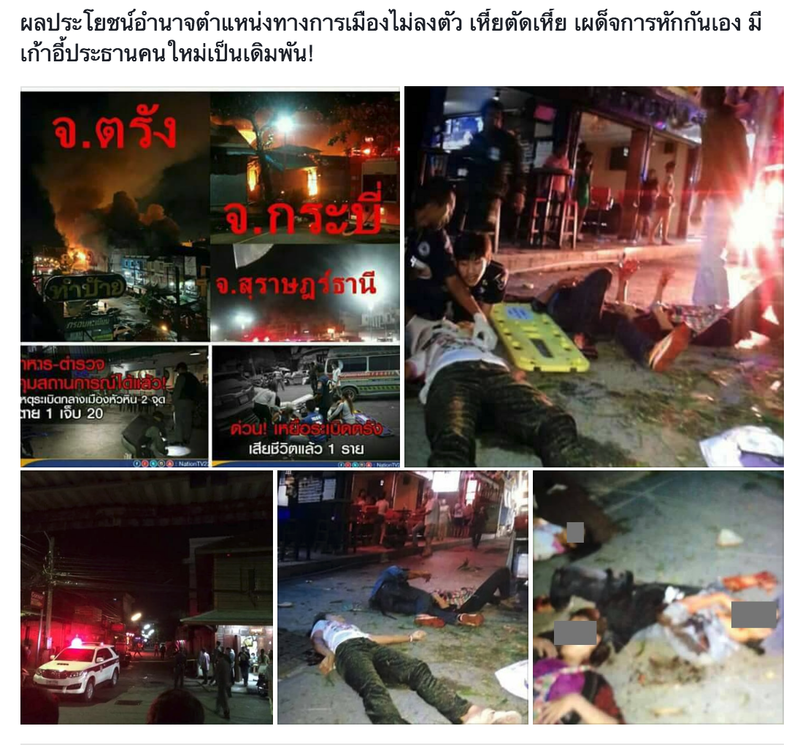 At about 10:40 p.m. on August 23, a bomb detonated at Southern View Hotel in downtown Pattani province. The explosion caused no casualties but drove panicked people to run to a nearby carpark. A second, larger bomb hidden in a hospital ambulance about 40 to 50 meters away exploded at about 11 p.m. One woman, Oraphan Sriuenhat, who worked at a food shop in front of the hotel, was killed. At least 30 people in the heavily populated area were injured. The hotel, shops, and homes were damaged by the blast. "The renewed bombings by Thailand's separatists show incredible depravity towards civilians," said Brad Adams, Asia director at Human Rights Watch. "Such attacks are war crimes, but the apparent planning behind them suggests crimes against humanity." The recent bombings used methods of attack long employed by armed separatist groups in predominantly ethnic Malay Muslim areas of southern Thailand, Human Rights Watch said. 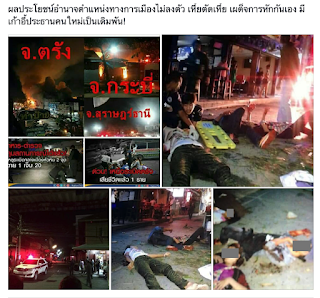 A police investigation also found evidence strongly suggesting that separatist groups were responsible for a string of explosions and arson attacks in seven tourist towns on August 11 and 12, that killed 4 civilians and wounded 35 others. Taken together, these attacks indicate a deliberate plan to attack and kill civilians that amount to crimes against humanity, Human Rights Watch said. Crimes against humanity consist of specific criminal acts committed on a widespread or systematic basis as part of an "attack on a civilian population," meaning there is some degree of planning or policy to commit the crimes. Such acts include murder and "other inhumane acts of a similar character intentionally causing great suffering or serious injury to body or to mental or physical health." International law protects "any" civilian population from attack, and there is no requirement that the victims are linked to any particular side of an armed conflict. Liability for crimes against humanity is not limited to those who carry out the acts, but also includes those who order, assist, or are otherwise complicit in the crimes. Under the principle of command responsibility, government or armed group leaders can be held criminally responsible for crimes committed by their subordinates when they knew or should have known that such crimes were being committed, but failed to take reasonable measures to stop them. Since the escalation of their armed attacks in January 2004, insurgents from the loose network of the BRN-Coordinate (Barisan Revolusi Nasional-Coordinate) separatist group have committed numerous violations of the laws of war. Of the more than 6,000 people killed in the ongoing conflict, about 90 percent have been civilians from the populations of ethnic Thai Buddhists and ethnic Malay Muslims in the provinces of Pattani, Yala, Narathiwat, and Songkhla. Although the insurgents have suffered major setbacks from recent government security sweeps, they still maintain a presence in hundreds of ethnic Malay Muslim villages. To recruit new members and justify acts of violence, insurgents point to abusive, heavy-handed tactics by government security forces. However, there is no legal justification or acceptable rationale to claims by insurgents that attacks on civilians are legitimate because the targets are part of the Thai Buddhist state or because their interpretation of Islamic law permits such attacks. The laws of war, applicable to the armed conflict in Thailand's southern border provinces, strictly prohibit attacks on civilians and civilian structures not being used for military purposes. Individuals who either order or deliberately carry out such attacks are responsible for war crimes, Human Rights Watch said. Human Rights Watch also remains deeply concerned by violations of international human rights law and the laws of war by Thai government security forces and militias. Killings, enforced disappearances, and torture cannot be justified as reprisals for insurgent attacks on the Thai Buddhist population and security personnel. This situation has been reinforced by an entrenched culture of impunity for human rights violations by officials in the southern border provinces. The government has yet to successfully prosecute any officials for human rights abuses against ethnic Malay Muslims alleged to be involved in the insurgency. "The Thai government needs to respond to these brutal attacks by upholding the rule of law, ending abuses by its own security forces, and addressing long-held grievances in the ethnic Malay Muslim community," Adams said. "If the government continues to shield its troops from criminal responsibility, it will only add fuel to the flames of extremist violence."